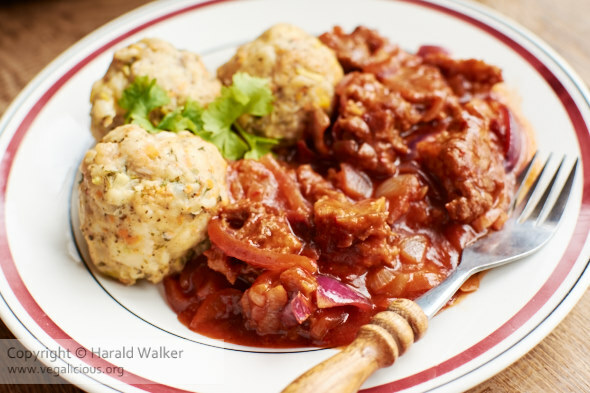 These dumplings are a vegan version of a traditional German dumpling called Semmelknödel. They are often served with a mushroom gravy or as a replacement for potatoes with goulash. We enjoyed them with a special seitan goulash made with dark beer. It was a delicious meal for a cold day. Tear the bread into small pieces and place in a large bowl. Heat a splash of oil in a small frying pan and lightly fry the onion until just soft. Add the onion to the bread and toss. Heat the non-dairy milk in a small saucepan and add the vegetable bouillon. Mix the soy flour or cornstarch with a bit more of the non-dairy milk and add to the heated milk. Pour the warm non-dairy milk mixture over the bread pieces and mix well with a fork or spoon. Allow the mixture to rest so the bread soaks up the milk mixture. Using your hands, either wet with water, or a bit of oil, form balls about the size of golf balls. Traditionally the dumplings are cooked in lightly salted gently boiling water, but they have often fallen apart for me. So, I steam them. Place a piece of baking parchment on the bottom of your steamer so the dumplings don’t stick to the holes. Steam the dumplings for 5-10 minutes until semi-solid to the touch. Posted by Chris Walker on January 16, 2015 in Side Dishes.